In Cirque Éloize’s “iD,’’ the city is alive, a place of wonder where anything can happen. Face-offs between rival gangs, attempts at love and friendship, and seemingly random street encounters in a futuristic urban environment give rise to displays of agility that are not just astonishing in the way they challenge the capacities of the human body — we expect that from circus performers of this caliber — but something even better: surprising. For example, in the production of “iD’’ that is at Citi Wang Theatre through Sunday, an in-line skater (Xuan Le) pivots and pirouettes, then suddenly leaps off the stage and dashes madly up the aisles with a stunt biker (Thibaut Philippe) in hot pursuit. As the pair make a furious circuit of the theater, with the biker popping wheelies inches from the delighted faces of audience members, it’s as if the venerable Wang has turned into the host venue for the X Games. Founded in 1993, the Montreal-based Cirque Éloize specializes in the fusion of circus arts, music, and dance — all of which contribute to making “iD’’ a memorable evening in the theater. Though Cirque Éloize signed a strategic partnership last year with Cirque du Soleil, the troupe’s sensibility seems more akin to that of Les 7 Doigts de la main, a contemporary circus ensemble (also based in Montreal) whose dazzling “PSY’’ was presented in January at the Cutler Majestic Theatre by ArtsEmerson. The identity of “iD’’ has as much to do with the creative team as it does with the 16 limber and daring performers onstage. The music by Jean-Phi Goncalves and Alex McMahon is propulsive and ethereal by turns, while choreographers Mourad Merzouki and Christian Garmatter have devised break-dancing numbers for the performers that provide explosive exclamation points to the juggling, hand-balancing, contortions, aerial silk, and Chinese pole routines. Robert Massicotte’s imposing set consists of a city skyline, either illuminated or darkened according to the mood of the piece, and a large structure of cubes and slots, on and around which the performers clamber and caper and into which they sometimes disappear. The vibe is surreal, although in lighter moments it’s reminiscent of the old “Laugh-In’’ set, from which Goldie Hawn et al. used to pop their heads out. Massicotte also created, along with Alexis Laurence, the video projections that make “iD’’ visually stunning at times. When an acrobat (Josianne Levasseur) positions herself on a metal wheel and begins turning in faster and faster revolutions, it’s undeniably cool, but it’s nothing we haven’t seen before in other circuses. But Massicotte and Laurence add an extra dimension that is (quite literally) out of this world: images of galaxies that appear to be rushing toward the acrobat, as if Levasseur is a planet that has spun out of orbit and is about to be engulfed by the cosmos. Not that multimedia touches are needed for this “Cirque’’ to hold our attention. In one remarkable display of strength and concentration, a shirtless performer (Richard Maguire) places one chair atop another, balancing and assembling at the same time, until he is precariously perched on a very high, and very fragile, wooden tower. At another point, when hard-hatted construction workers begin blasting away with jackhammers onstage — talk about your urban symphonies — we might think we’re about to see a dance routine. But the jackhammers turn out to be giant pogo sticks, enabling the performers to bound about the stage like kangaroos. Of all the feats pulled off by the young performers of “iD,’’ perhaps the most impressive is the appearance of spontaneity. After all, these circus artists must have practiced their acts for countless hours, honing them to the split-second precision of a Swiss timepiece. Yet they manage to make the audience feel as if each routine emerges not just organically but inevitably from their surroundings. That’s true even of the electrifying “trampowall’’ finale. To be sure, the trampowall is also a popular feature of Cirque du Soleil shows. 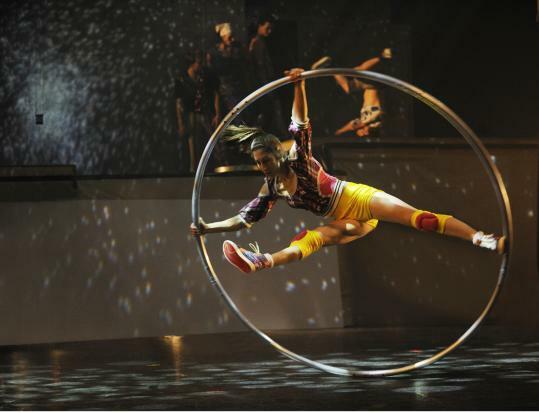 But as with much else in the innovative “iD,’’ Cirque Éloize puts its own stamp on the routine, so it is anything but. Directed by: Jeannot Painchaud. Sets, Robert Massicotte. Lights, Nicolas Descoteaux. Costumes, Linda Brunelle. Video, Massicotte and Alexis Laurence. Music, Jean-Phi Goncalves and Alex McMahon. Choreography, Mourad Merzouki and Christian Garmatter.